HUNGRY GHOST: What A Real Hungry Ghost Can, Will And Really Do Just To You! What A Real Hungry Ghost Can, Will And Really Do ...Just To You! It's The most Wonderful Haunted Time of the year to go into hiding! Tell Me when it's September 1st! The many living ideas of bad health, falling sicknesses, problems or mental phobias and troubles a person had while alive and now are dead can be transferred to you a living person! The real problems of the ghost that come to haunt you in August pass over to the person they desire or try and do often openly possess. You should be watchful of young children as they are susceptible to this more then stable adults. Adults with serious mental health problems are at risk also. If a person is in morning over a recently dead loved one then they too are at the highest level of being the victim of a Hungry Ghost. Hungry Ghost are the most Malicious evil of ghosts that a paranormal Investigator can deal with on a one to one basis. The ghost and what makes them more problem some is that they are usually an entire family unit. and they attack an individual all at once. I have seen people caused to commit crimes, Families torn apart by their great haunted collective energies. Divorce and even individuals institutionalized for life because a Hungry Ghost has had it's way with someone's mind. If you notice your child picking up a facial tick or strange expressions, speaking like a person older then their years, or a mannerism of a long dead relative watch out! They might be possessed by a family hungry ghost. These possessions usually gradually take hold. 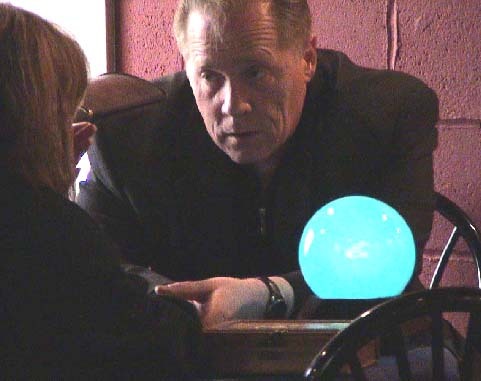 Many ghost hunting groups have had this happen to members of weak will and often need to seek help of well seasoned Ghost or Paranormal Investigators who know how to deal with such problems. The real haunted presence of a evil Hungry Ghosts brings about powerful mood swings in individuals. Often noticed as strong negative or even positive emotional outbursts through to profound clinical depression. Remember this is a different personality taking over the individual. Ghosts can provoke the possessed person to forms of behavior which are not in the person's character, Strong Ego or even a drive to take over where the person was more of a follower before this. Strong acts of aggression, violence etc. If a trait like that already exists in a person it will be 10 times intensified considerably by the ghost. Haunted Toys are often possessed by hungry ghosts during the month of August. The spirits and souls of Loved ones usually hide in your children's favorite toys. Teddy Bears and dolls or the first toys to become haunted. Toy cars and even books are not free of becoming haunted. anything a child has owns or touches could house an evil presence. In some locations around the world each year these favorite play things are all thrown out on the last day of July and the child is not bought any new playthings until three months latter in fear that all the toys on shelves in stores might be haunted by Hungry Ghost. If you find a Child has a toy in the month of August that they will not let go of Beware it might be the ghost of a dead relative waiting to possess them in September. A Haunted Teddy Bear Photo sent to Haunted America Tours by Greg Ketchum. Ketchum believes his dead Grandmothers Hungry Ghost haunts his childhood toy. He is afraid to be rid of it because you don't just give or sell real ghosts away just like that. Especially if you know who they are! Could Robert the Haunted Doll be really Possessed by a Hungry Ghost? To often Ghost hunters who do not have enough experience sorting out these issue tend to throw their hands up in the air and run thinking it is a full blown Demonic possession. Or write off the possessed person as just another ghost nut trying to get attention. When A Ghost Is A Ghost Is A Real Ghost! Hungry Ghosts can influence behavior and lead people to dependence on alcohol, drugs as well as to many other unwanted sexual and malicious acts. When it happens to a young child, many run for cover thinking it is the Devil himself at work. It could just be a real pest of a Hungry Ghost and you as a novice or a fool are not qualified to see it as such. Ghost and Paranormal investigators are often the target of hostile things from Hungry Ghost. I have seen and heard so often a Ghost hunter with a few years under their belt say." I can't deal with all the crazy claims and nutty people who seek me out." Could it be the person who is telling them they are haunted is really possessed by a Hungry Ghost? Hungry Ghost Possessed people will go as far as to saying they are a demon, a evil or even a saint that possess a person. Often Hungry Ghost will let a priest or a Exorcism take place and pretend to depart. I said yes pretend! To leave one to think they are gone and hide in the person only to pop up in later years. Many paranormal Investigators such as myself think that when a Ghost possessed person gets caught . Then the Ghost has no recourse to leave it just plays along. The reason so many believe those are the hardest ghost to be rid if once again is because their genetic make up and souls fiber are believe to be so similar that they are easily accepted by the living body as being able to accept it and not have the persons mind be able to over come it. In essence they they believe the thoughts they think or their own. When a Twins has the Hungry ghost of their own dead twin enter their body the symbiotic ties they once had are now unified. If one twin was evil the other good then usually a happy medium is met. If both are evil then look out! Hungry ghosts sometimes look for ways to get the person who's body they have taken over to get the original persons soul out so they can live again with out always fighting for control. And real ghost Exorcisms in the 21st Century is typical. Oh and I did forget to tell you a person can become possessed by many Hungry Ghosts at once! I bet you can't wait until it's September First !?! Please Also See: Think you know what a real ghost won't or can't do? The first lady of conjuring the Dead. The ancient art of Necromancy is still alive today with Waugh at it's main investigator. LISA LEE HARP WAUGH Is a necromancer in the 21st century. www.ghosthuntersofamerica.com. Waugh is not a witch though she has studied the occult she has never claimed to be a bone conjurer or a wiccan. Waugh has been featured on several paranormal programs that are nationwide on the radio and worldwide on the Internet. And also in many printed publications worldwide. She is also considered a authority on Hauntings and ghosts motives for such.